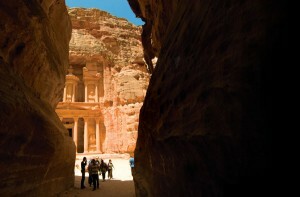 History comes alive and whispers secrets of antiquity on Great Safaris Jordan – 4 Days extension. In the spectacular country of Jordan, discover Amman, its capital and one of the oldest continually inhabited cities in the world. Marvel at Jerash with its Roman architecture dating back 2,000 years. Inhabited since the Bronze Age, Jerash is known for the ruins of the walled Greco-Roman settlement of Gerasa just outside the modern city, including the 2nd-century Hadrian’s Arch, the Corinthian columns of the Temple of Artemis and the huge Forum’s oval colonnade. Tour the Crusader Fortress at Kerak, one of the largest crusader castles, whose construction dates to the 1140s. Prepare to be overwhelmed at the “rose red” city of Petra. Great Safaris Jordan – 4 Days extension includes 1 night accommodation in Amman and 2 nights in Petra, breakfast daily, full schedule of sightseeing and all transfers.